This is a difficult subject to broach in any context, but particularly so in a prim and proper family book such as this, where it would be absolutely gauche to mention Dominique Strauss-Kahn, Elliot Spitzer, or their libertine friends. 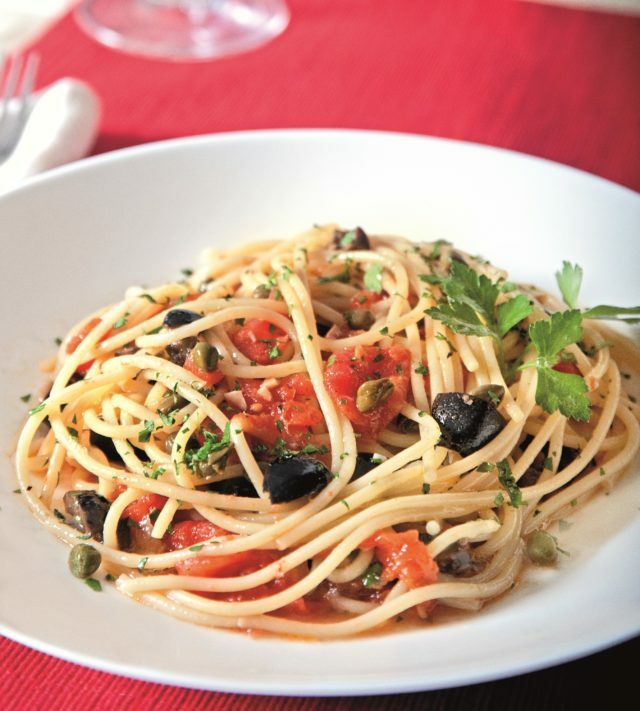 But if you-know-what is the world’s oldest profession, then spaghetti puttanesca must be the world’s oldest pasta recipe. And there is no shame in that. In fact, those working girls who created it really did know a little something about spicy, cheap, and easy. A touch of this, a handful of that, with a little bite, and a big kick, this dish delivers every time. No questions asked. Satisfaction guaranteed. p.s. Check out our wine pairings to complement this dish. Also our about to see more about this dish. In a large skillet over medium heat sauté the garlic and anchovies in the olive oil until garlic is golden. Add the tomatoes, olives and capers. Cook on medium heat for 15-20 minutes, until reduced. Cook the spaghetti until al dente (about 2 minutes less than the package directions) and drain it. Add to the tomato sauce and mix to thoroughly combine. Definitely a bold flavored recipe. The fish and the garlic gives it that flavor & kick. One of my favorites and made it for years. Now being on this “almost” fat free diet for past 5 months or so, so can’t have it. Can now only use a tiny bit of olive oil for taste (1/4 teaspoon or less). Using Spray fat free olive oil, just doesn’t make it. I have had to get very creative with my cooking and getting truly bored. Any ideas? Hopefully, one day I can have it all again when my gall bladder stops reacting. Oh well, this too will pass!! So weird since I rarely ate fried food or really fatty food. I love basil and I was wondering if adding it would make the recipe less authentic Italian. Thanks. Your preamble is as delicious as the dish. Great fun, great taste.